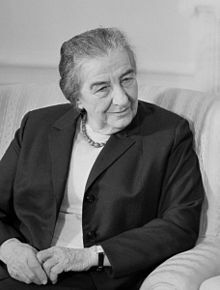 ↑ "Golda Meir: An Outline of a Unique Life: A Chronological Survey of Golda Meir's Life and Legacy". The Golda Meir Center for Political Leadership (Metropolitan State University of Denver). Retrieved February 20, 2014. Reference on name pronunciation (see "1956").